Part of the magic of Uig Lodge is that it comes with its own private fly fishing. It has the wonderful advantage over other fisheries of being able to offer its guests an entire river system to fish, from the lochs to the sea. 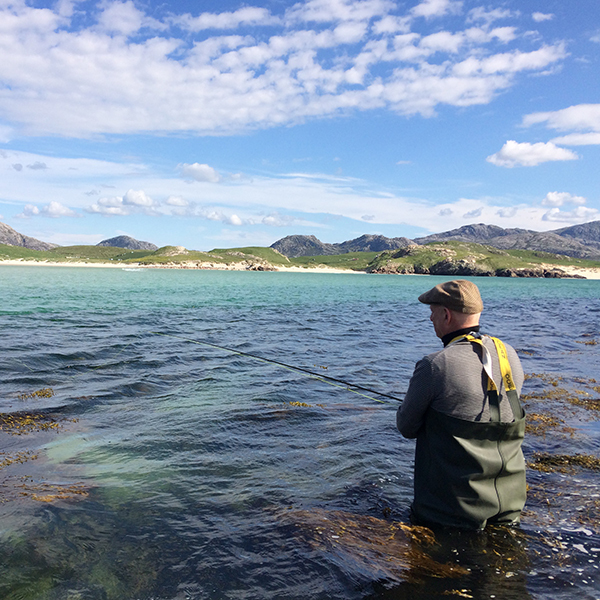 With recent annual catches on the Fhorsa system of over 100 salmon, 50 sea trout and 400 brown trout, Uig is a superb all-round fishery and has plenty to offer the experienced fisherman as well as the complete beginner. You are spoilt for choice with this rugged coastline, peppered with spectacular white sandy beaches and crystal clear waters. On a sunny day when the sea becomes a brilliant turquoise, you could mistake these beaches for a tropical paradise. Boasting the highest shell content in Scotland (around 80-95%), the beaches of Uig are amongst the best in the world. 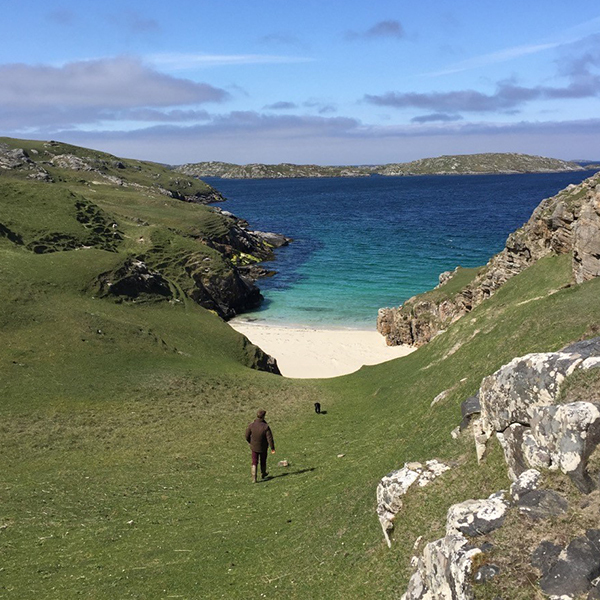 Stroll down the hill onto the stunning sands of Uig Bay for some beach cricket and a barbecue, or take a short drive and discover some of Lewis’s smaller but equally beautiful soft sand beaches. Whichever one you choose, you are likely to have it all to yourself. 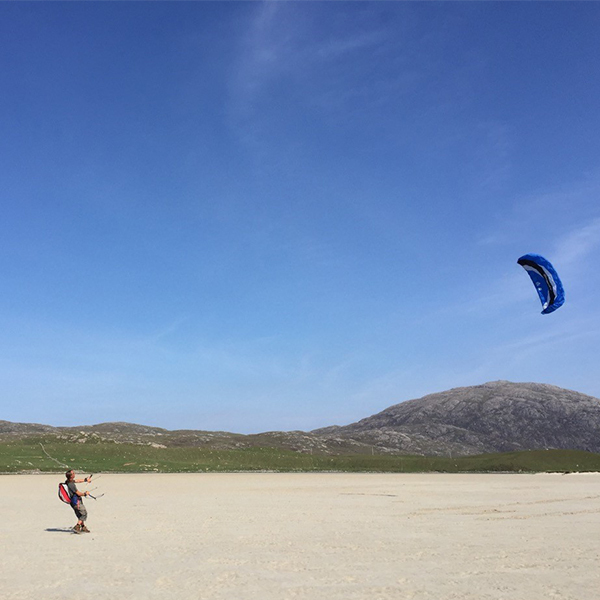 Uig Bay is ideal for swimming, power kiting, kite surfing and kite buggying, and kayaking is also popular off the smaller quieter beaches. The wilder beaches, open to the Atlantic, have fantastic year round surf and between September and April the waves offer the experienced surfer some of Europe’s most supreme conditions. Mangersta Beach, a few miles down the coast, has probably the best surfing conditions on the island. Its wild seas are not suitable for children but there are plenty of coves and caves to explore and when the tide is out, numerous small pools appear for children to play in. Surfing tuition and equipment hire can be arranged locally. n the summer, boat trips can be arranged to deserted islands and otherwise inaccessible beaches, including the stunning ‘Blue Lagoon’ of Pabay. These trips can also be combined with some sea fishing for mackerel and pollock..
With the ever changing light, spectacular unspoilt scenery, dramatic weather conditions and a rich legacy of history and culture, Lewis is alive with opportunities for amateur and professional artists. The island has a thriving collection of galleries with art and photography courses available, making Uig Lodge a perfect base for you to indulge in your art. With notice, we can arrange work shops at Uig Lodge – please enquire for further information. Lewis is steeped in both history and mystery, going back over 8,000 years since man is believed to have first inhabited the island. Experience traditional island life in the restored Blackhouse Village of Gearrannan and visit the ancient stone circles at Callanish and the Dun Carloway Broch (Iron Age fort) which dates from 100-300BC. Lewis is also home to the Trussel Stone, the largest single standing stone in Scotland. See how the world famous Harris Tweed is made. Harris Tweed is one of the great surviving craft industries and is the only fabric in the world that is governed by its own Act of Parliament. By law, it can only be produced in the Outer Hebrides by weavers working in their own homes, using pure virgin wool dyed and spun in the Outer Hebrides. 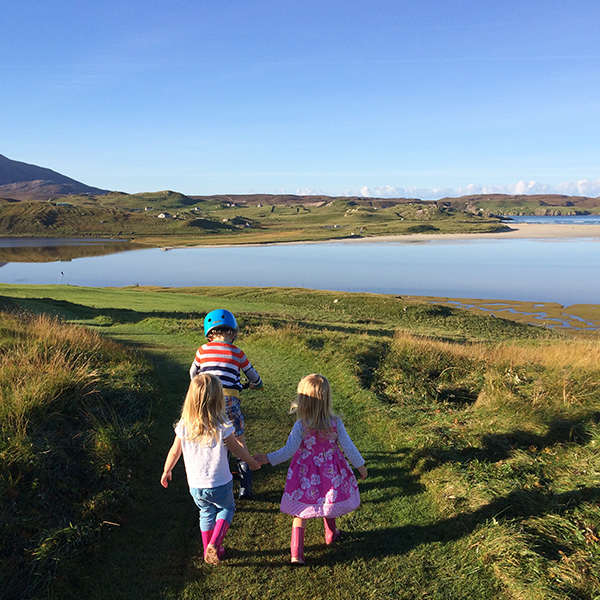 Thanks to the recent discovery of a map detailing the original 1930s golf course, Uig Lodge has restored its small but enchanting 9 hole course overlooking the beautiful bay. The course is solely for the private use of the guests. There is also an 18 hole parkland course in Stornoway, or head down to Harris Golf Course and play 9 holes on what Nick Faldo describes as the “most beautiful course” he has played. With miles of beautiful beaches, glistening hill lochs, empty glens and dramatic mountain views, the west coast of Lewis is a walker’s paradise, brimming with wildlife from golden eagles and red deer in the hills, to seals and rare seabirds on the coast. Whales and dolphins can sometimes be seen and it’s not unusual to spot an otter. In the summer the machair is amass with colourful wild flowers including a wide range of orchids. The spectacular cliffs of Lewis are home to several species of seabird including fulmars, kittiwakes, shags, gannets and black guillemots. The fresh and salt water lochs are where you will find a large variety of waders and other shoreline feeding birds, including redshanks, oystercatchers, curlews, ringed plovers and the elusive black throated divers. Take a speedboat trip to the Flannan Islands to see the puffins and storm petrels, or venture further afield to the UNESCO World Heritage Site of St Kilda; home to the largest seabird colony in Scotland.